This article first appeared in The Edge Financial Daily, on April 23, 2018. In a dilapidated kampung house in narrow Jalan Trusan in Jelutong, hurriedly done up to house political party machinery, sits a man with a big vision, but a small budget, to save Penang. Former Penang DAP organising secretary Teh Yee Cheu — a two-term Tanjung Bungah assemblyman — left the party a day after the dissolution of Parliament on April 7 and will be contesting the May 9 general election under the Parti Sosialis Malaysia (PSM) ticket. In a state that has spawned many centre-left political personalities, parties and rights-based non-governmental organisations, Teh’s decision to take on the role of a rebel seeking justice for his people comes as no surprise. The 60-year-old parted ways with DAP after 18 years, primarily because he was unsuccessful in convincing it that the mega reclamation and infrastructure projects undertaken by the state government, led by the party, are bad for the environment. His call to limit the tenure of the chief minister to two terms — a stance once taken by the DAP — also fell on deaf ears while his campaign to protect the rights of transgender people failed to win support. 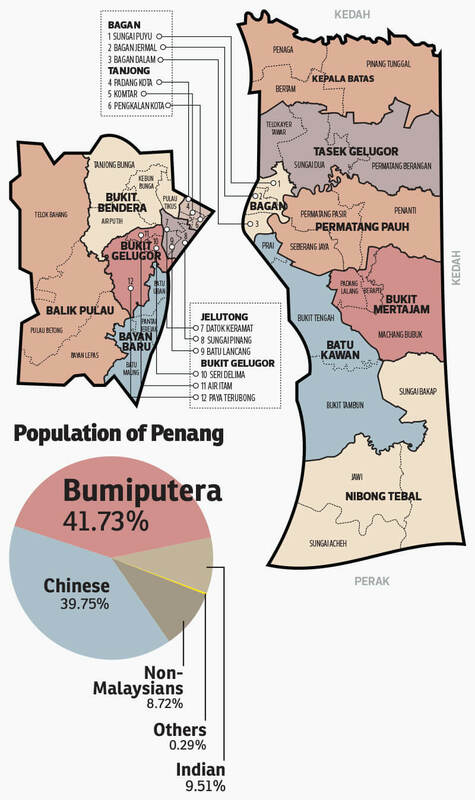 Most analysts project another resounding win for Pakatan Harapan in Penang after its upset victory in 2008 and a second triumph in 2013. Teh, however, says there is discontent among voters due to over-development that has led to flooding and other problems. The two major floods in July and November last year, which caused several deaths and massive property damage, serve as a grim reminder of the importance of safeguarding the environment. He will be contesting the Sungai Pinang seat. “I chose Sungai Pinang because of the issues here. Being an urban village with one of the island’s main rivers running through it, it bears the brunt of development. Infrastructure and traffic are strained as the place becomes over-developed. “Sungai Pinang is facing a second wave of development after the 1960s when it was identified as a satellite town. To date, more than 40% of kampung land has been developed and private land sold, but property developers only offer one home to each household. Usually, more than one family lives in a house. “Most can’t afford affordable units priced from RM200,000 to RM400,000 in these parts. There should be more low- and low-medium-cost units priced from RM75,000 to RM200,000 but the government has no will to do this,” Teh says. Most voters, however, may prefer to focus on national issues. Take car salesman Louis Tan. “The Barisan Nasional (BN) [federal] government has caused more problems than the Pakatan [state] government,” he says. Political analyst Wong Chin Huat agrees that Penangites will largely vote based on national issues. “Some segments are growing critical of the state government on environmental issues but BN has little credentials in championing environment or good governance issues,” he says. Wong says Parti Cinta Malaysia and Parti Rakyat Malaysia (PRM), which plan to field non-Malay candidates in Penang, do not stand any chance. PAS’ plan to field non-Muslim candidates will also be a major failure, he adds. PAS intends to contest 18 state seats, as does PRM. The newly formed People’s Alternative Party (PAP) and Malaysian United Party (MUP) are also expected to field candidates in the state. 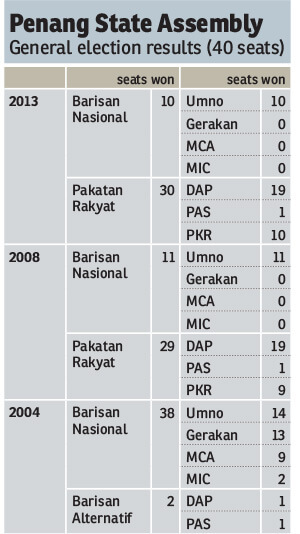 The then Pakatan Rakyat won 30 of the 40 state seats in Penang in 2013. This time, DAP will contest 19 seats, PKR 14, Parti Pribumi Bersatu Malaysia (PPBM) four, and Parti Amanah Negara three. For the parliamentary constituencies, DAP will contest seven seats, PKR four, and PPBM and Amanah, one each. Political observers say the entry of new parties is not going to have a significant impact. The general perception among most people is that the Pakatan administration is people-centric and has succeeded in bringing a lot of improvement to the state. For instance, Penang recorded a gross domestic product (GDP) growth of 5.6% in 2016 from 5.5% in 2015, with GDP per capita rising 30% to RM47,322 in 2016 from RM33,597 in 2010. The unemployment rate in 2016 was 2.1%, the second lowest nationwide, while total investments totalled RM10.8 billion last year — the second-highest level after Johor. Meanwhile, Penang BN has been firing salvos at the Pakatan government, claiming it has failed to meet 51 promises made since 2008. These include the absence of 20,000 affordable housing units in Bandar Cassia, Batu Kawan; lack of tram, monorail and light rail transit systems; and failure to gazette the Penang Island Local Plan and George Town Special Area Plan. The one issue BN has been highlighting over and over again is the RM6.3 billion integrated infrastructure project involving a 7.2km undersea tunnel, two bypasses and a highway. They question the cost of the feasibility studies, detailed design of the tunnel, and environmental impact assessment. Investigations by the Malaysian Anti-Corruption Agency are ongoing, but the state government has repeatedly denied allegations of wrongdoing. BN’s election manifesto for Penang promises to cancel the project and cease land reclamation involving land-swap deals to finance the infrastructure projects, including the RM27 billion Penang Transport Master Plan. Penang BN chief Teng Chang Yeow says the development undertaken by the Pakatan government thus far has brought little benefit, unlike BN projects such as the setting up of urban transformation centres. “What sort of planning does the government have? Where is the quality of life? A lot of land has been sold to private developers. The state is pro-developer instead of protecting the people’s interests,” he says. Pulau Betong Umno assemblyman Datuk Farid Saad says a paradigm shift for sustainable development is needed. “Pakatan cannot go on like this. But the people have also come to realise this, especially Malay voters,” he says. Umno’s challenge, however, is reaching out to voters in rural areas where PPBM is present. Wong notes that Umno retained its 10 seats in 2013 with less than 60% of the total votes, a few of them with just a bare majority. Hence, even a small swing in Malay support may see the seats changing hands.